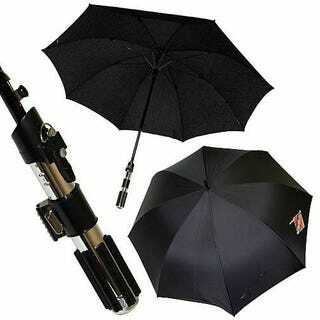 Now available for your handy dandy arsenal of lightsaber gear is this umbrella. No longer will your lightsaber MP3 player, Skype phone, universal remote or MacBook be lonely. I feel like such a nerd describing this, but the umbrella's handle is a black lightsaber and no part of the umbrella lights up, which is very unfortunate for the diehard fans out there. It is available for $100 and would be perfect to shield yourself and your imaginary date on a rainy evening.